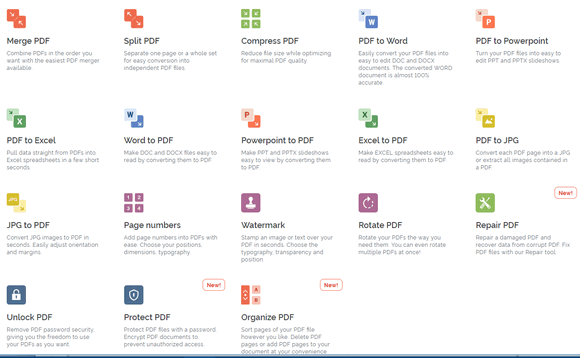 Every tool you need to work with PDFs in one place. Every tool you need to use PDFs, at your fingertips. All are 100% FREE and easy to use! Merge, split, compress, convert, rotate, unlock and watermark PDFs with just a few clicks. I don’t necessarily “love” PDF. I love chocolate chip cookies. But I Love PDF is the name of our site pick today. So, gotta love it! This site will appeal to those of you who work with PDF file quite often and who find some of the free PDF readers lacking. Now, first of all, if you have Windows 10 (any version) you can create and read PDF files with ease. But, Windows 10’s PDF feature is not as robust as those found in some of the better PDF readers, like Foxit Reader (free version), Sumatra, and others. Read more about creating and reading PDF in Windows 10 without third-party programs of any kind. Recently, while looking for something else, I stumbled upon a site that looked interesting, This morning I finally had a few minutes to take a look at it and test some of its features. Needless to say, I was very impressed, otherwise, it wouldn’t be named a Cloudeight Site Pick! The number of useful free PDF services that this site offers, combined with its speed (but remember site speed is dependent on your internet connection speed too) got my attention. As I’ve mentioned, the site is called “I Love PDF” (more correctly ilovepdf.com ) and it offers a number of free services without requiring that you register and without any discernible tricks, tricks or subterfuge. The site appears to be financially supported by non-intrusive ads and by the products/services it sells. But all of its PDF tools are free to use and do not require registration. Here’s a list of the free PDF tools you’ll find on I Love PDF. Merge PDF – Combine PDFs in the order you want with the easiest PDF merger available. Split PDF – Separate one page or a whole set for easy conversion into independent PDF files. Compress PDF – Reduce file size while optimizing for maximal PDF quality. PDF to WORD – Easily convert your PDF files into easy to edit DOC and DOCX documents. The converted WORD document is almost 100% accurate. PDF to POWERPOINT – Turn your PDF files into easy to edit PPT and PPTX slideshows. PDF to EXCEL – Pull data straight from PDFs into EXCEL spreadsheets in a few short seconds. WORD to PDF – Make DOC and DOCX files easy to read by converting them to PDF. POWERPOINT to PDF – Make PPT and PPTX slideshows easy to view by converting them to PDF. EXCEL to PDF – Make EXCEL spreadsheets easy to read by converting them to PDF. PDF to JPG – Convert each PDF page into a JPG or extract all images contained in a PDF. JPG to PDF – Convert JPG images to PDF in seconds. Easily adjust orientation and margins. Page numbers – Add page numbers into PDFs with ease. Choose your positions, dimensions, typography. Watermark – Stamp an image or text over your PDF in seconds. Choose the typography, transparency and position. Unlock PDF – Remove PDF password security, giving you the freedom to use your PDFs as you want. Rotate PDF – Rotate your PDFs the way you need them. You can even rotate multiple PDFs at once! Repair PDF — Upload a corrupt PDF and we will try to fix it. Depending on how much the PDF is damaged we will be able to recover it partially or completely. Unlock PDF — Unlock PDF password security, giving you the freedom to use your PDFs as you want. Protect PDF — Protect PDF files with a password. Encrypt PDF documents to prevent unauthorizd access. Organize PDF — Sort, add and delete PDF pages. Drag and drop the page thumbnails and sort them in our PDF organizer. I Love PDF couldn’t be any easier to use. You choose the PDF file on your computer you want to edit/convert/change. Then you upload it to I Love PDF by selecting it or dragging it to the I Love PDF page. To perform the task you’ve chosen, all you have to do is click a button. In a few seconds (or minutes depending on how many pages you’re working with and how large they are) the task you chose is completed. Next, just download the modified files to your PC. If you’re working with multiple pages, you will download the files in zip format. If you work with PDF files often, then we think you will find I LOVE PDF easy to love. Visit I Love PDF now and give it a try. I’ve been using this site for years and it’s never done me wrong! Great pick. Not being very knowledgeable about the working of PDF, I wonder if one of the many options here will create fillable pdf forms? ILovePDF is more for manipulating and converting other files and PDF files than it is for creating PDF file. If you want to create PDF forms, take a look at this site. This sounds like a wonderful resource. However, it’s not helping me with my current problem, opening a scrap (powerpoint 2003) file. The current Powerpoint program will not open this, and it’s an important file that I need to open and hopefully convert to a current program. Thank you for all you do, and the great resources you find. You are the best. I used the online version to do a page rotation for one file and then to merge several separate pages into one pdf file. It worked well… almost too well! There was a link on the webpage to download the work it had done, but I did not have to click the link. It just ‘pushed’ the two completed files to my downloads folder before I had clicked on the link. That seems a little scary to me. How can it put files on my computer without my initiating and approving that action? I am not sure what you mean by “online” version. The only version I see is online and that’s what we recommended. Are we talking about the same site? http://www.ilovepdf.com ? We tested several features of the public version (i.e. not the one you sign up for)… when we finished editing the files or merging files, we were always presented with a download button to click – not files were “pushed” anywhere. Just to be sure, I went back today and tested Word to PDF and the feature you’re referring too – merge files. On both of the tests, a download button was presented and nothing was pushed – and no attempts were made to push anything to my PC. I don’t see anything wrong with the way ILovePDF processes the actions requested or in the way it displays a download button when the process/processes is/are completed. I merged 4 PDF documents just a minute ago to see if I saw what you saw and I did not. What I did see was this – a clearly labeled download button. The file downloaded to my computer after clicking the file was the merged PDF file with the name of ilovepdf-merged.pdf – but the file name was editable. I renamed it “merged.pdf” and opened it. The 3 PDF documents were merged perfectly and the merged PDF doc was 125 pages. I am not seeing anything wrong here. Yes it was the same site. And, yes, I saw the very same link as you posted in your reply. The download was not only started but completed before I clicked the download link for both of the little ‘jobs’ that I had it do. I was very surprised (unbelieving?) the first time it happened (rotation of a single page pdf) and so I was watching more carefully for the second job (merge of about 6 or 7 pages of pdf files) and the same thing happened. Now, maybe my wife put a little extra something in my coffee that morning… I don’t know…. They also offer a desktop (offline) version of their software. The link for it is in the top right corner of their front page. The graphic for the link is a black-and-white picture of a computer monitor with a ‘down’ arrow in it. That is why I specified that I was using the online version. Sorry, I was trying to prevent confusion, not create it. Oh! And yes, I was using the ‘public’ version as well: I was not signed up or signed in with any kind of an account.